With its Zen CPU architecture, AMD finally offered a competitive product, a CPU line that can fight with Intel CPUs both in term of performance and price. Zen processors were one of the biggest surprises of 2017, at least when we talk about hardware. They offered excellent performance-price ration, with more cores than the competition along with solid working frequencies and TPD ratings. Now, AMD officially announced its 2nd generation of Ryzen processors that should come in April. The company also announced APUs based on Ryzen architecture, that should offer incredible performance for notebooks and users who don’t need beastly graphics power. And finally, AMD gave us a bit of info regarding its 7nm Vega GPU architecture that should bring noticeable power optimizations, deeply lacking in current Vega 64 and Vega 56 graphics cards. Now, AMD is getting ready to launch its Zen+ architecture that should offer smaller production process, slightly higher clocks, and better power optimization. 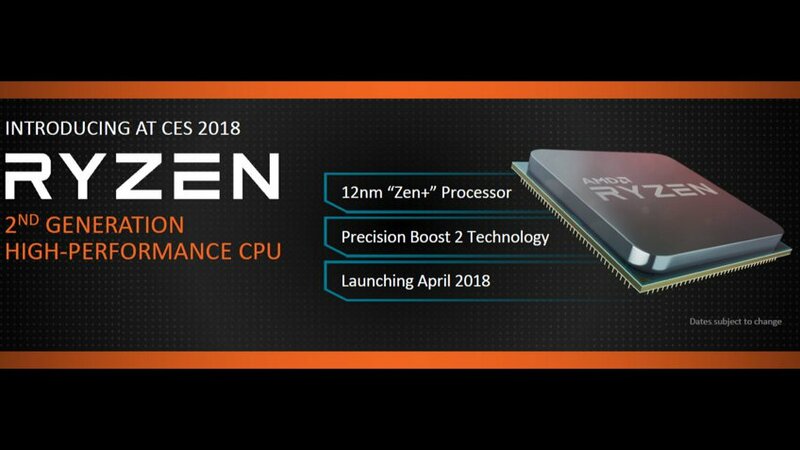 The 2nd generation of Ryzen CPUs will hit the market during April and will be based on a 12nm production process. A step in the right direction, since the current Ryzen CPUs are based on the 14nm manufacturing process. The smaller manufacturing process will bring higher clocks, along with better power optimization, which is excellent news since even the first Ryzen processors offer excellent optimization when it comes to power consumption. This means even more power for the price, so if you plan on getting a new CPU, wait for April and get one of the new Zen+ CPUs. 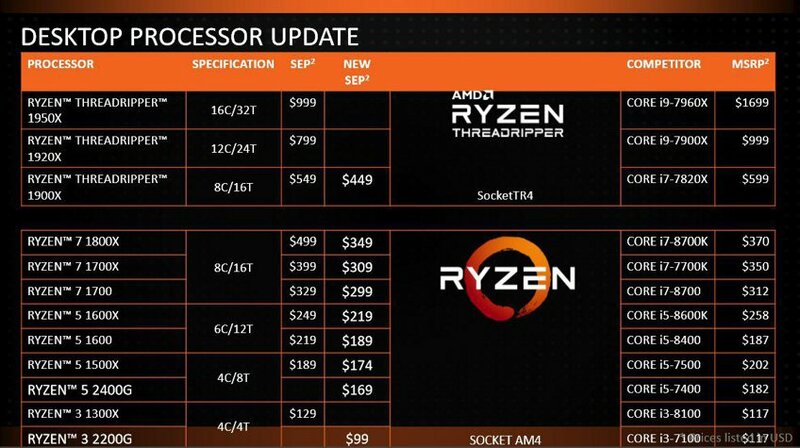 If you can’t wait, the company announced that all of its 1st generation Ryzen processors are getting a price cut, with Ryzen 7 1800X now costing $349, Ryzen 7 1700X being dropped to $309, and the excellent Ryzen 5 1600 now costing just $219. You can see all price changes below. Further, the company plans to launch the second generation of Threadripper CPUs along with Ryzen Pro APUs during the second half of 2018. And it is excellent to see that AMD already has a roadmap ready for launching 7nm Zen 2 and Zen 3 CPUs, which should bring noticeable upgrades and offer superb price to power ratio. It’s worth noting that all current AM4 socket motherboards will support all Ryzen CPUs until 2020. Of course, if you want to pair your new 2nd generation Ryzen with a new chipset, the company will launch a new X470 chipset along with the new CPU line. AMD also announced new APU lineup that combines Zen cores and Vega graphics chips. The lineup consists out of two desktop and seven mobile APU models. Desktop variants include the Ryzen 5 2400G (4 cores/8 threads) for $169 and Ryzen 3 2200G (4 cores/4 threads) for $99. They should offer excellent power for users who don’t need top image quality when playing games. The two models will launch during the first half of February. As for the mobile APUs, the company announced seven models in total. They should bring excellent gaming power to laptops since Vega GPUs should offer a solid number of details in most games at 1080p resolution, even on affordable notebooks. Last, but not least, AMD announced that the first 7nm-based Vega GPUs are going to see the light of day during this year. They won’t be offered to the gaming market, and instead will be used for machine learning tasks. This is excellent news since the company managed to advance from 14nm production process to a 7nm one in just one year. As for the gaming-oriented 7nm Vega graphics cards, they should come during the second part of 2018. AMD is getting serious. New Ryzen generation looks sleek, and while it won’t bring many improvements, it will keep the company close to Intel until the 2019 and the release of the 7nm Zen 2 architecture that should offer much more power. AMD also looks better when it comes to the GPU market. Their new 7nm Vega products will probably be competitive to the upcoming Nvidia Volta architecture, and while 7nm Vega probably won’t top Volta GPUs, it should at least make Nvidia sweat a bit.